Mr Bradley John Murdoch, 45, is charged with murdering Falconio and the alleged, unlawful assault and deprivation of liberty of Falconio's then girlfriend Joanne Lees on July 14, 2001. However, Nine had a minor victory, with the court quashing two smaller suppression orders relating to the publication of Mr Murdoch's photo and details of where he was arrested. Magistrate McGregor last week banned the publication of several sections of the prosecution's opening address in order to ensure Mr Murdoch would receive a fair hearing should the case proceed to jury trial. The sections relate to four strands of, alleged, evidence - that the defence may challenge at trial - which allegedly link Mr Murdoch to the killing. Mr Murdoch's committal hearing is now expected to resume in Darwin Magistrates Court. Lees, who took to the witness stand a week ago, is midway through her testimony about the night her boyfriend of six years disappeared. Justice David Angel said the Supreme Court decided Mr McGregor had power under section 58 of the Evidence Act to make the other suppression orders. While the ban on publishing photographs of Mr Murdoch was lifted, the court had been told earlier that any publication of the image was still a contempt of court given identification was an issue in the committal. 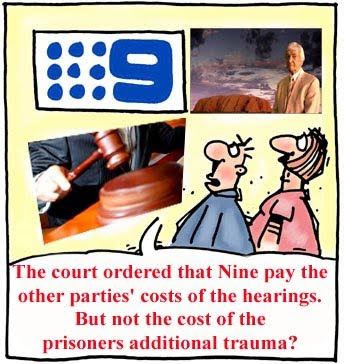 The court ordered that Nine pay the other parties' costs of the hearings. Extensive legal argument over what the media can publish has stalled the committal hearing into the alleged murder of 28-year-old of Mr Falconio for a week. Lees, who is now expected to resume her testimony this morning, has arrived at court under heavy police guard, hidden under a piece of black material in the back of a car.